OROKLINI Larger Than Average Apartment. Sleeps up to 6 from €325 p/w. Penelope Kizi Court is a complex which is found in the heart of the commercial centre of Larnaca in Hermes Str. The complex is two minutes walk from the beach front of Phinikoudes and the Marina, and from the coffee shops and restaurants and generally to the most important places that Larnaca offers. This one bedroom apartment on the 4th floor comprises kitchen fitted with all appliances, and patio doors which lead to a covered area for dining on the large terrace. Lounge is furnished with sofa bed for extra sleeping, TV and DVD player. Double aspect patio doors lead to the larger than average terrace, which is rare for town centre complexes. Double bedroom with French doors and ample wardrobe space. Outside terrace area is furnished with dining table and chairs and sun loungers for private bathing. Views of Larnaca can be fully appreciated from the sun terrace. If you are interested in renting property 1079, please fill in and submit this form and we will contact you shortly, or please use our contact form if you also want to send us a message, quoting Ref 1079. On the edge of Larnaca Bay, the palm-lined seafront of Larnaca town bustles with cafes, tavernas, shops and bars. Historic charm is lent to the scene by its fortress castle, now used as the town's summer cultural centre. Larnaca is an excellent base from which to get to know the central and eastern section of Cyprus, and its proximity to the International Airport and a number of luxury hotels that have been developed along its beautiful sandy beaches make this a popular holiday choice. Larnaca was originally known as Kition, or Khittim, and legend has it that the first settlement at the spot was founded by Noah's grandson, Khittim. 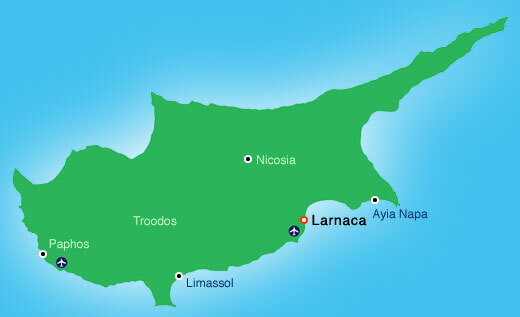 But the name Larnaca probably comes from the Greek word 'Larnax', which means sarcophagus, many of which have been unearthed in this area. The heart of the tourist area is Dhekelia Road. There are numerous restaurants, pubs and shops along this stretch of road, which is the main road into Larnaca town centre. A number of blue flag beaches line Dhekelia Road, together with all the main Larnaca hotels.